Ground-source heat pump and in-floor radiant system heat the building extremely efficiently. Heat pump converts 53° water from underground tubes to 95° for heating the building. Heat pump uses a compressor to extract heat and increase temperature in the radiant heat system. Five heat pumps help the keep the Bullitt Center thermally comfortable throughout the year. Four are designated for heating the building and one is designated for hot water in the taps and the heat recovery system. The heat pump is a very efficient system because it simply transfers heat instead of generating it through the burning of fuels. In the most basic sense, the heat pump system is comprised of three closed loops: the ground source heat loop, the heat pump itself, and the radiant heat coils. Below the exhibition space, the Bullitt Center has 26 root-like wells that dive down 400 hundred feet below the ground surface. In these cylinders is a closed loop tube filled with a water and glycol mixture. The mixture is pumped through the tubes, absorbing the heat from the earth, which at this depth has an ambient temperature of 53° F. This heated mixture then returns to the heat pump. Once at the heat pump, the 53° water and glycol washes through a set of coils filled with a liquid that evaporates at a very low temperature. The vapor is then pushed into the opposite set of coils through a compressor, turning the water vapor into a very hot liquid. This heat is then given off to the water and glycol mixture that runs through the radiant tubing in the floors of the building. The radiant tubes run through the building at 90° F, giving off their heat through the concrete, effectively warming the building in the winter. 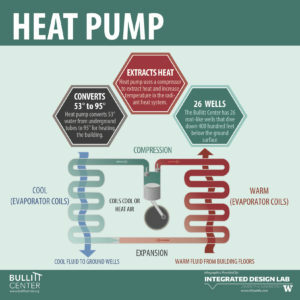 In the summer, these pumps can be run in reverse if necessary, so that the radiant tubes can pump cool fluids through the ‘veins’ of the Bullitt Center. This process is closed-loop and cyclical, and the only input is the energy to run the pumps and compressors, which is sourced from the large array of solar panels on the roof.